Do you agree that a good sandwich should be easy to make and have a ooey-gooey cheese just bubbling out of it? I love seeing a wonderful sandwich that will hit the right spot and also make me drool just looking at it. 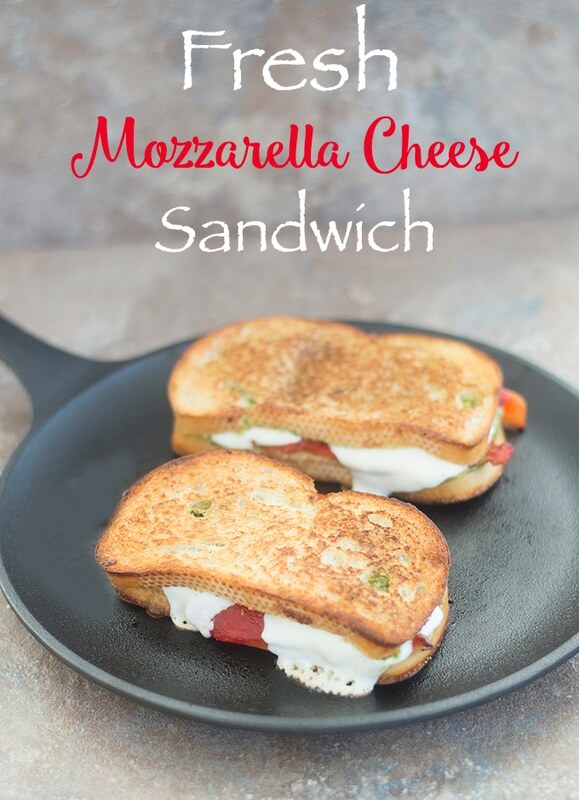 This recipe has fresh mozzarella cheese that I got from the deli moments before I put it in this sandwich. Do you agree that a good sandwich should be easy to make and have a ooey gooey cheese just bubbling out of it? I love seeing a wonderful sandwich that will hit the right spot and also make me drool just looking at it. 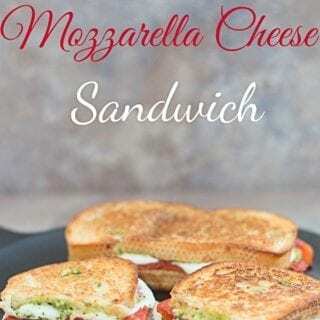 This recipe has fresh mozzarella cheese that I got from the deli moments before I put it in this sandwich. 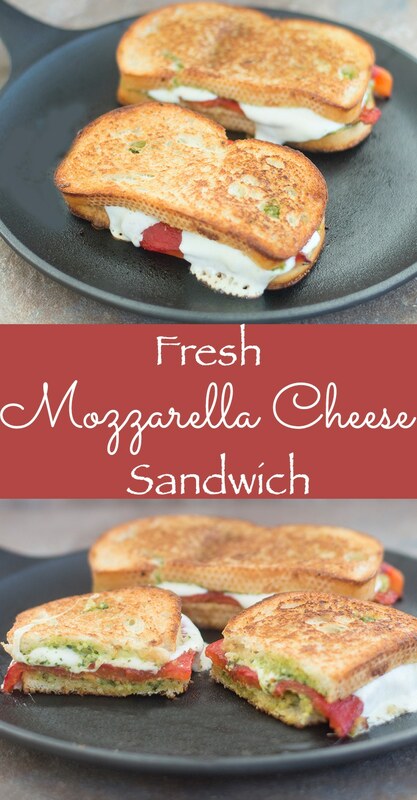 That is why the mozzarella is melting so elegantly in the sandwich. The sight of a melting mozzarella cheese tends to warm the soul. When I pulled it out of the oven, I could hear the cheese sizzling and it took every ounce of willpower I had to not eat it right away. If only I didn’t have to photograph it first…. This sandwich is made with all fresh ingredients. It has Fresh mozzarella melted with freshly roasted red pepper on fresh Italian bread with freshly made homemade arugula pesto spread. It has become my favorite sandwich to eat for Sunday Brunch. In fact, I think I will take it to work with me whenever I can. The red pepper takes only about 10 minutes only to roast in the oven. The skin comes off easily after the roasting process. What remains is a juicy and tangy red pepper. It provides the texture to this otherwise light sandwich. I strongly recommend roasting the pepper at home instead of buying the store bought version. I roasted this sandwich on the stove first. When both sides of the bread were browned, I placed it in the oven and let the cheese melt. After about 6 minutes, I pulled it out and used a spatula to plate it. Serve it while the cheese is still sizzling because it will lift up the spirit of your guest with each bite. A roasted red pepper has so many uses. In the past, I have made a pasta sauce with it and even put it into a homemade ketchup recipe. All its rich and delicious flavors are brought out in the roasting. What is your favorite sandwich recipe? 2) On a baking tray, place one red pepper (washed and dried) and put it in the heated oven. I don’t baste it with oil or wrap it in foil. 3) Let it roast for about 7 minutes. Rotate it and cook for 7-10 more minutes until all sides are charred black. The air on the inside of the red pepper is being pushed out, so, don’t be surprised if it collapses on itself. 4) Remove from the oven and let it cool. Set oven to 450 degrees. 9) Take 4 slices of Italian bread and spread the pesto on one side. 12) Add Mozzarella slices and close the with bread slice. 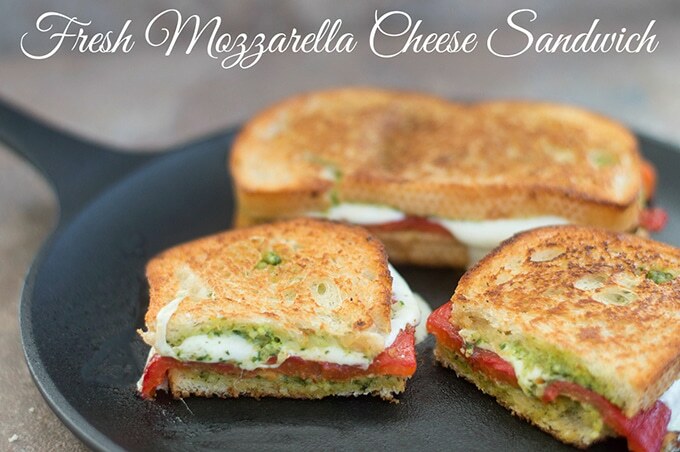 The pesto side should be touching the mozzarella. Assemble the 2nd sandwich. 15) Cook each side for 2-4 minutes on medium. It should be slightly browned when you flip it. 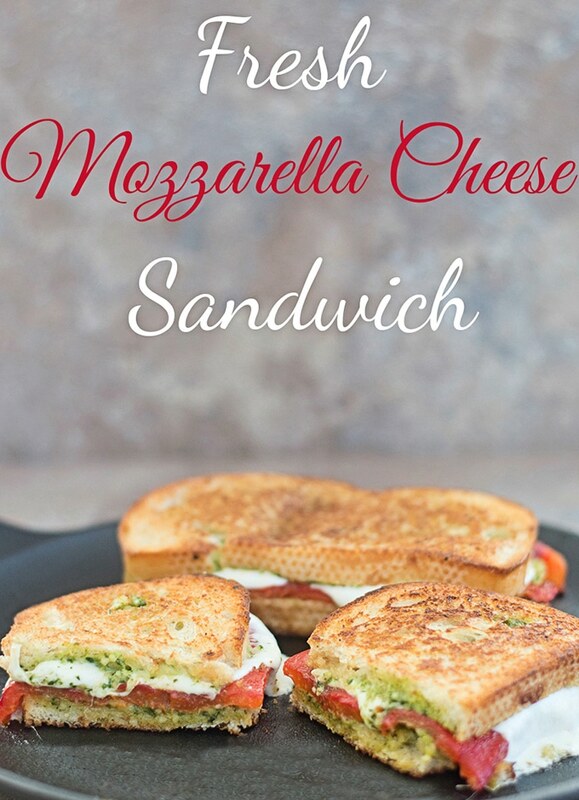 Mozzarella Cheese Sandwich made with fresh cheese, roasted red peppers and homemade arugula pesto spread. Let it roast for about 15-20 minutes. Rotate it at about the 7 minute mark and remove when all sides have charred black. Remove from the oven and let it cool. Set the oven to 450 degrees. Take a mozzarella ball and slice it into thin pieces. Take one slice and with the arugula pesto side up and layer with the red pepper first. Use a brush and lightly brush the top of the red pepper with 1/2 tsp balsamic vinegar. Cook on each side for about 2-4 minutes on medium heat. It should be slightly browned when you flip it over. Place the skillet with the sandwich in the oven for about 5-7 minutes. Remove from the oven and use a spatula to plate it. For this recipe, I used 2 cups of arugula. However, I added it to the food processor in 4 portion. Once each portion was partially processed, add the next batch. After adding the last portion of the arugula, add 1 tsp of salt, 2 Tbsp of extra virgin olive oil and 1 Thai chili. Blend everything until it is smooth. The air on the inside of the red pepper is being pushed out, so, don't be surprised if it collapses on itself. Would tomatoes work instead of peppers? This is full of the things I love! Great sandwich!